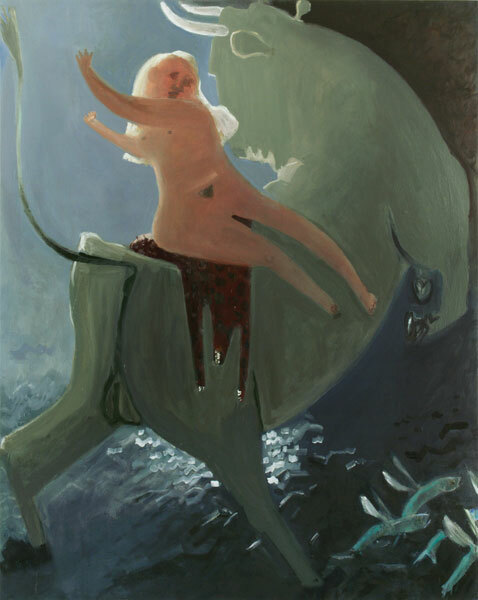 Kyle Staver, Europa and the Flying Fish, 2011, oil on canvas, 68 x 54 inches. “Lately I have been painting dragons, distressed maidens, and bulls with bad intentions. Titian, Rembrandt, Picasso, Redon, and Ryder have all preceded me to this trough and drunk deeply. “Perhaps the greatest inspiration for my recent work is the Metropolitan Museum’s Courbet exhibition: the personal/mythic narrative and atmosphere in Courbet’s work reminds me of the dark and weighty atmosphere of my native northern Minnesota, where the winter sun sets early and night goes on forever. The Northern light also leaves many corners shrouded and ambiguous. My palette is now deeper, and the emotional tone of the paintings veers toward anxiety as seen in Stags at Pork Chop Hill, with deer caught in a train’s headlights on a cold winter night. The Boys of Pinetop Pond D inhabits a dark pine forest clearing with a foreboding drama unnamed but clearly sensed. The scenes in Europa and The Flying Fish (2011), Danae and the Parakeet (2011), Diana and Acteon (2012), Prometheus (2012), and St. George and the Dragon (2012) operate as Mythical metaphors for looming unavoidable disaster. My works have moved away from personal vignettes to more universally shared narratives. 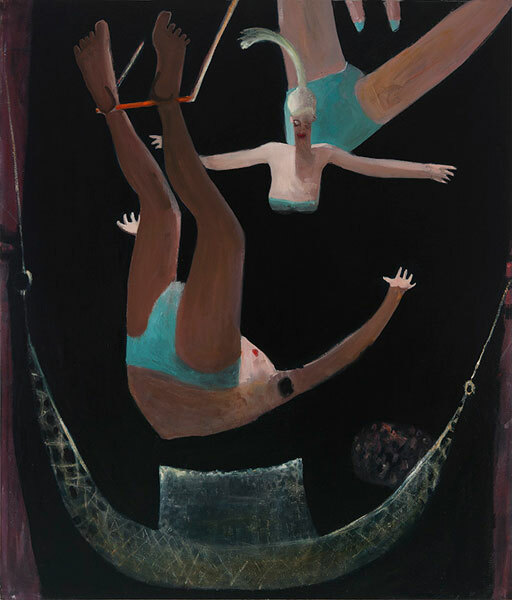 Kyle Staver, Trapeze, 2012, oil on canvas, 68 x 58 inches. Images courtesy of the artist. “Kyle Staver: Paintings, Prints, Reliefs,” John Davis Gallery, Hudson, NY. Janaury 31 -February 24, 2013.